My insane decision to watch Doctor Who from the start is about to hit a rocky patch. Seasons 4 and 5 are decimated in the archives. A live story is something rare and delicate. Sadly this is a recon. I say sadly because it actually seems quite good. There is a grittiness to the tale, however Jamie is barely in it, odd considering he is to join the crew! 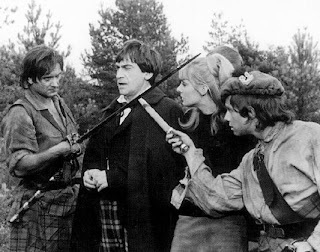 There is also some very silly voices from Patrick Troughton and a massive amount of cross dressing (I don't mean angry). Ben manages to come off well with his bluff persona but Polly fares slightly worse, being stuck in the femme fatale role. This is better than a boy I suppose. The core story actually revolves around white slavery and is very grim, however it is hampered by the comedy character of Algernon Ffinch. Perhaps this would have worked better with live action rather then the truly horrific reconstruction. Overall a hard trek as a recon but what feels like an underlying good story. Its a shame it is gone forever.